North Korea suggested a new dialogue Monday to resolve tensions over its atomic weapons programs - an apparent invitation to the U.S. to engage in one-on-one talks after Pyongyang bolstered its negotiating power with nuclear and missile tests. Hours earlier, however, Secretary of State Hillary Rodham Clinton told Pyongyang to stick to six-nation talks that the North has rejected. Clinton said the multilateral framework is "the appropriate way to engage with North Korea." "North Korea has now made starkly clear that it wants to open a direct dialogue with the U.S.," said CBS News foreign affairs analyst Pamela Falk. "That puts Pyongyang eyeball-to-eyeball with Secretary of State Clinton." Monday's statement from Pyongyang's Foreign Ministry marks a rare expression of willingness to talk by a regime that has escalated tensions with a flurry of provocations in recent months, including a nuclear test and a series of banned missile tests. It also suggests that the communist regime thinks it has raised its stakes enough, and it's time to negotiate. "There is a specific and reserved form of dialogue that can address the current situation," the ministry's statement carried by the official Korean Central News Agency said. 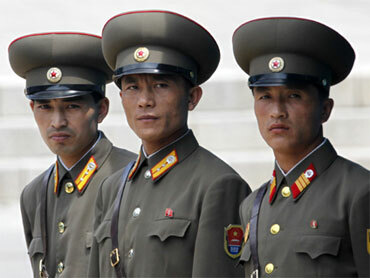 The statement Monday underscored what North Korean U.N. Ambassador Sin Sun Ho told Falk last week, "because the government of Kim Jong Il evidently does not think Washington is getting the message." The ministry's statement did not elaborate on the new form of dialogue. But Pyongyang has long been known to be seeking direct negotiations with Washington. "Of course, it refers to bilateral dialogue," said Kim Yong-hyun, a professor at Seoul's Dongguk University. "For now, I think the North wants negotiation rather than a new provocation" as it has put forward all its negotiating cards, he said. North Korea has ratcheted up tensions at a rapid pace. It conducted a long-range rocket launch in April, quit the six-nation nuclear talks, restarted its nuclear facilities, conducted its second-ever nuclear test, and test-launched a barrage of banned ballistic missiles. In Monday's statement, the North made clear again it won't return to six-nation nuclear talks involving China, Japan, the two Koreas, Russia and the U.S.
"It became all the more clear that other parties are taking advantage of these six-party talks to seek their ulterior aims to disarm and incapacitate the (North) so that it can only subsist on the bread crumbs thrown away by them," it said. The brief sentence mentioning dialogue was tucked at the end of the long harangue against the multilateral process. Unlike previous ones, however, Monday's statement lacked any threats, further suggesting Pyongyang is looking for a negotiated solution. Such small shifts can mean much when trying to read North Korea, one of the world's most isolated nations. North Korea's main Rodong Sinmun newspaper also said Sunday that the country's envoy told an Asian security conference in Thailand last week that the nuclear standoff was a matter only between Pyongyang and Washington. The United States says it is willing to hold direct talks within the six-nation process if North Korea returns to the negotiating table and takes irreversible steps for denuclearization. As a way of pressuring Pyongyang to the talks, Washington has been rallying international support for stringent enforcement of a U.N. sanctions resolution adopted to punish the North for its nuclear test on May 25. Clinton praised China - the North's main ally and benefactor - for being "extremely positive and productive" in pressuring Pyongyang to abandon its nuclear program. "On North Korea, we've been extremely gratified by their forward-leaning commitment to sanctions and the private messages that they have conveyed to the North Koreans," Clinton said Sunday on NBC television's "Meet the Press." On Monday, South Korea blacklisted five North Korean officials, four companies and a state agency in line with the U.N. sanctions. The sanctions include travel bans and a freeze on the financial assets against those blacklisted, but the move is largely symbolic because the firms don't do business with South Korea and the officials don't travel to the South. North Korea has bristled at the talk of sanctions. Its defense chief threatened Sunday that the country will "mercilessly and resolutely counter the enemy's sanctions with retaliation." Defense Minister Kim Yong Chun also vowed to deal "unimaginably deadly blows" to the United States and South Korea if they attack the communist nation, according to Pyongyang's official Korean Central News Agency. Kim spoke at a national meeting on the eve of the anniversary of the armistice that ended the 1950-53 Korean War. North Korea often accuses Washington and Seoul of plotting to invade the nation. Pyongyang says its pursuit of atomic bombs are to defend against what it calls "U.S. nuclear threats." Washington and Seoul have disavowed any intention of invading the North and say their military drills are purely defensive. The divided Korean peninsula is still technically in a state of war because the 1953 cease-fire has never been converted into a peace treaty.